CANTON, Mass. (November 3, 2014) – Today is National Sandwich Day, and Dunkin’ Donuts is marking the holiday with a meaty announcement for both steak and sandwich fans. 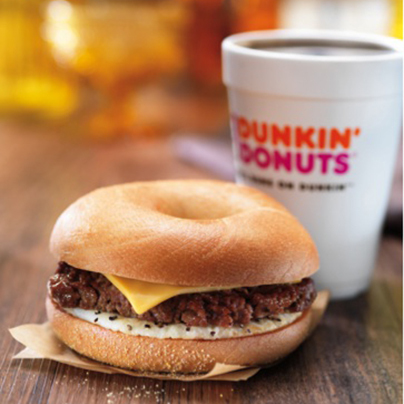 Dunkin’ Donuts has brought back the Angus Steak & Egg Breakfast Sandwich and Angus Steak & Egg Wake-Up Wrap®. Both are now permanent additions to the brand’s lineup of tasty and satisfying premium sandwiches. The Angus Steak & Egg Breakfast Sandwich features an Angus Steak patty with egg and American cheese on an oven-toasted plain bagel, and the Angus Steak & Egg Wake-Up Wrap is served oven-toasted with half of an Angus Steak patty with half of an egg and American cheese on a flour tortilla. Both sandwiches can be customized on other Dunkin’ Donuts baked goods, such as croissants or English Muffins. Both are available at participating Dunkin’ Donuts restaurants nationwide. According to The NPD Group/National Eating Trends®, for the Year Ending February 2014, sandwiches are the #1 food item on the list of foods that make up the American diet. To celebrate America’s favorite food, Dunkin’ Donuts is raising the “steaks” for fans on National Sandwich Day with a special “Claim Your Steak” Twitter Sweepstakes. Today between 9 AM and 6 PM ET, followers of @DunkinDonuts on Twitter can share why they deserve to celebrate National Sandwich Day with an Angus Steak & Egg Breakfast Sandwich, using special hashtag #DDAngusSteakSweeps. Throughout the day, Dunkin’ Donuts will select a total of 100 random participants to receive a $25 mGift so they can claim their steak by enjoying one of the brand’s new Angus Steak sandwiches and other favorite Dunkin’ Donuts food and beverages. No purchase necessary, must be 18+ to enter. Void where prohibited. For additional terms and conditions related to Dunkin’ Donuts’ “Claim Your Steak” Twitter Sweepstakes, visit http://dun.kn/1pbtZFb. Dunkin’ Donuts offers a full lineup of bakery sandwiches, available all day, such as two varieties of chicken sandwiches, Bacon Ranch and Barbecue, along with Ham & Cheese, Turkey, Cheddar & Bacon, Chicken Salad, and Tuna Salad sandwiches. With several breakfast sandwich choices featuring favorites such as cherrywood smoked bacon, aged cheddar cheese, freshly baked croissants, bagels or toasted English Muffins, Dunkin’ Donuts provides delicious and satisfying options for guests to start the morning and keep running any time of day as well. Also debuting at Dunkin’ Donuts today are new Croissant Donuts. Dunkin’ Donuts’ Croissant Donut features a delicate and flaky croissant ring that is glazed like a donut. The Croissant Donut will be made in limited quantities and served each day while supplies last for a limited time only at participating Dunkin’ Donuts restaurants nationwide.